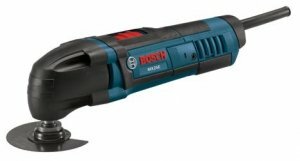 We knew a corded version of Bosch oscillating multi-tool would be coming eventually, then we saw it a few months back when it hit the European store shelves. We had our hopes high thinking it would be coming soon to the US, then we found out from CopTool back in December that Home Depot had an online exclusive to sell the tool. That is right, you could only get the MX25E if you ordered it from HD online. But now finally the wait is over. Next month the MX25E will be available for everyone at tool dealers and home centers nationwide. So why did we want the Bosch MX25E so much? Because finally, we have a contractor grade corded oscillation tool to go up against the original king of oscillating multi-tools, Fein. Sure there are the Rockwell and the Dremel versions, but those are intended more for hobby or DIY use. The Bosch is going head to head with Fein, but spec wise, the tools have some similarities and some differences. The power behind both tools is similar at 2.5 amps for Bosch and 2.3 for Fein, and the max oscillation speed is similar at 20,000 for Bosch and 21,000 for Fein, but Bosch as them beat at the low end, 8,000 vs 12,000 for Fein. Here is where things get interesting, the MX25E has a smaller angle (2.8 degrees) of oscillation compared to the Fein of the Rockwell (3.2 degrees). Some more Bosch specific specs include a patented Constant Electronics Circuitry technology that ensures the tool will maintain speed under load and a stacked construction design that reduces vibration and gives the MX25E its small size. Overall the tool only weighs 3.3 pounds. There are some specification differences vs Fein, but the biggest difference is in the price. The Bosch comes in at around $150 for the MX25EC kit and around $200 for the MX25EK kit, while Fein's most basic kit cost around $300. With such a big difference in price, is it really fair to compare the two side by side? The MX25EC-21 includes 4 high-quality cutting, grinding and scraping accessories, 16 sanding accessories, an accessory box and carrying bag. The MX25EK-33 includes 6 high-quality cutting, grinding and scraping accessories, 26 sanding accessories, an accessory box and carrying case. Both models use the OIS system accessories that Bosch developed and is becoming an industry standard, but they also include an OSCAD1 adapter that allows the tool to use many competitor accessories.